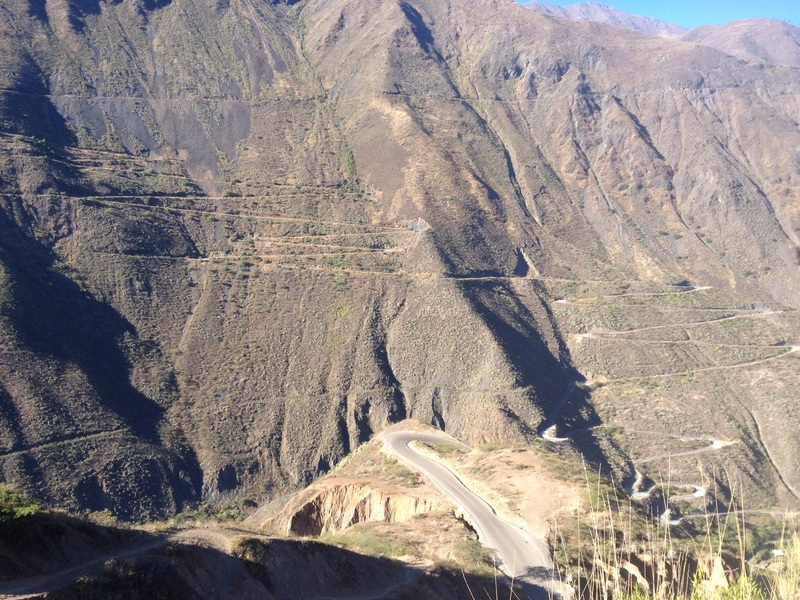 About nine months ago, on google maps, I spotted some spectacular climbs in Peru with 20 or more hairpin bends on one single slope. Also, the infamous Canon del Pato was not far from this. The excitement and anticipation to ride this section was building up ever since. 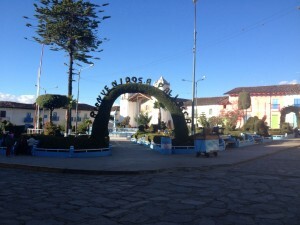 The shortening of the three day ride to Huamachuco into two days based on the route profile turned out to be an over estimation. 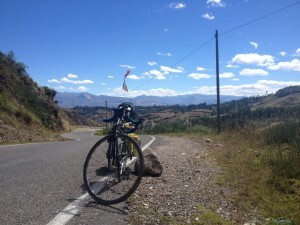 The first day ride from Cajamarca to Aguas Calientes was mostly downhill and went fine. The hot water at this thermal spring was just a swimming pool with luke warm water, not really a great attraction. The second day ride to Huamachuco was thoroughly enjoyable but went a bit too long and was tougher than expected. The whole section was paved, albeit single lane, with very little traffic if any. 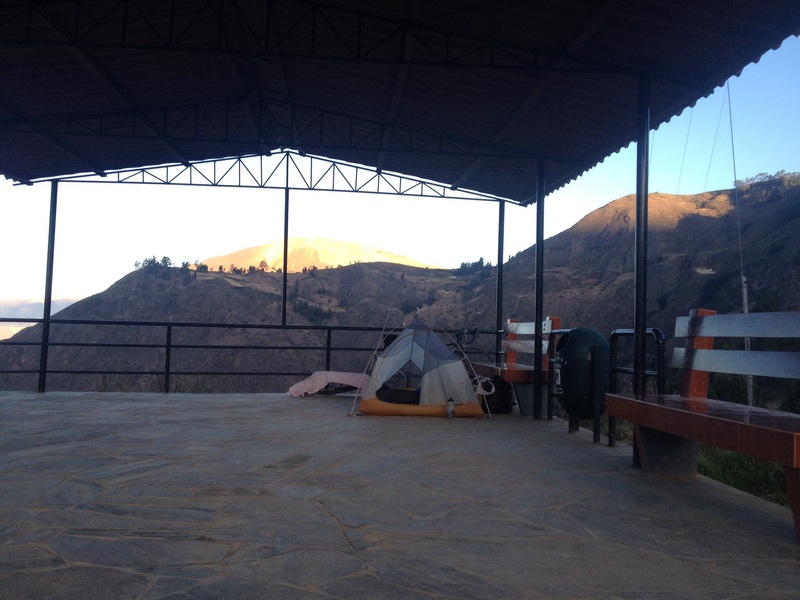 The day that was saved up was spent resting in Huamachuco. The next few days were the ones that I have been looking forward to for a long time. With the help of several blogs and more importantly Google Satellite app, I knew which sections were paved. 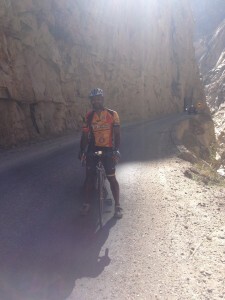 However, the big help came from Jason Coles with whom I had cycled on and off for few days since Colombia. Jason who knew my bicycle warned me to skip the section between Huamachuco to Mollepata and again Chuquicara to Huallanca. Both of these were dirt roads covered by lots of gravel. I was prepared to ride roads if it were compact dir but coming into Huamachuco, the previous day, I had few Km’s of road where the road was gravel where I had to resort to pushing my bike which was not pleasant. Based on this, it was indeed the best decision to get a bus/motor vehicle for the sections Jason recommended. Some of these places were so remote that getting a public transport was more adventurous than riding it. From Huamachuco there was only one transit van per day to Cachicadan scheduled at 3am in the morning (a distance of 47 Km’s). There was no other choice so I had to get to the terminal at 3am only to find out that the transit van on that particular day lacked a roof top carrier to take my bicycle. The driver left without me. It was not the best place to be stranded that too at 4 am and in the cold. But luck was on my side. A pickup truck was going to a nearby town and offered to take me at a cost. Well something is better than nothing. The direct route was not paved and it was dangerous even for motor vehicles so he had to drive around via another town. He left me at Santiago de Chuco at 8 am from where I decided to take a bus to my destination, Mollepata. It took me two full hours to confirm the only bus that goes to Mollepata from Santiago de Chuco since no body seemed to knew the exact times neither the bus stop. It just seemed like people never travelled outside their villages. After about four hours wait the bus arrived and I was on my way. The dirt road was narrow and the corners were too small for the bus to turn where he had to reverse and do lot of back and forth motion to get through. It took about full 6 hours for this 63 Km’s and we eventually arrived in Mollepata around 7pm. It was an exhausting day about 16 hours to reach Mollepata which was only about 107 Km’s away in total from Huamachuco. No wonder why people in these areas don’t travel much. 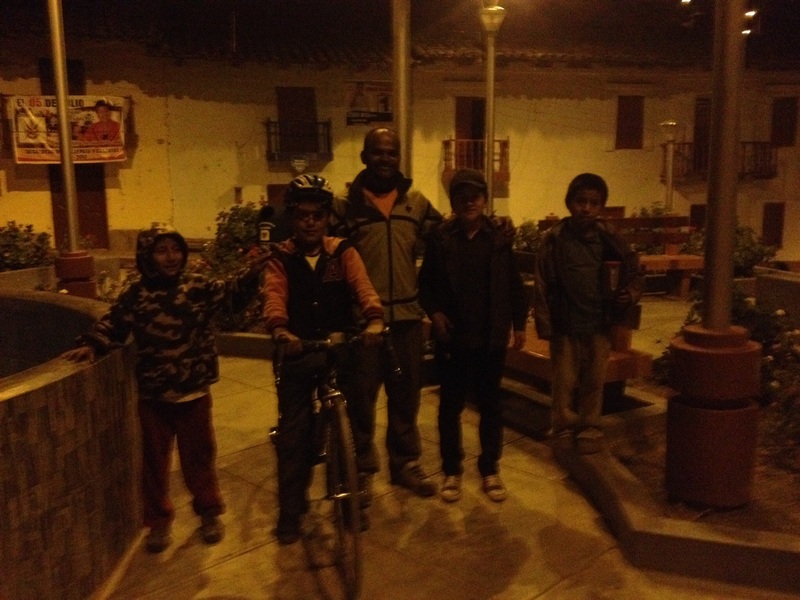 Gringo calling is very common in Peru but the kids in Mollepata knew not to use this word. Some kids who boarded the bus in the previous village knew that I am a cyclist. I was surprised since they haven’t even seen my bicycle yet. Apparently, the only foreigners who travelled through this area were only cyclists. These kids knew a lot about cycling and camping gear. They showed me the spot where cyclists usually camped out and helped me to put my tent up for the night. They were asking to see my stove and all the camping gear. Their knowledge of the touring gear was fantastic. Thanks to all the previous cyclists these kids have great respect for cyclists and were very welcoming. I felt very safe. This was a very small village on the top of a cliff. The clear skies revealed the full moon and the stars. The weather was nice and cooler, neither cold nor hot. The views from my tent were stunning. After an adventurous day this was a happy ending a very happy ending indeed. Within a kilometre of descent from Mollepata the view that I was looking forward to was laying in front of my eyes, the quintessential Peruvian road with lots of hair pin bends, 22 as counted by other cyclists, all the way to Pallasca about 40 kilometres away, which was a village on the top of mountain on the other side of the canyon. The first ten kilometres was downhill to the river from where the road ascends, about 1500 metres climb, via these 22 hair pin bends. The entire section was paved. After about four and half hours later I arrived in Pallasca at an altitude of 3000 metres. 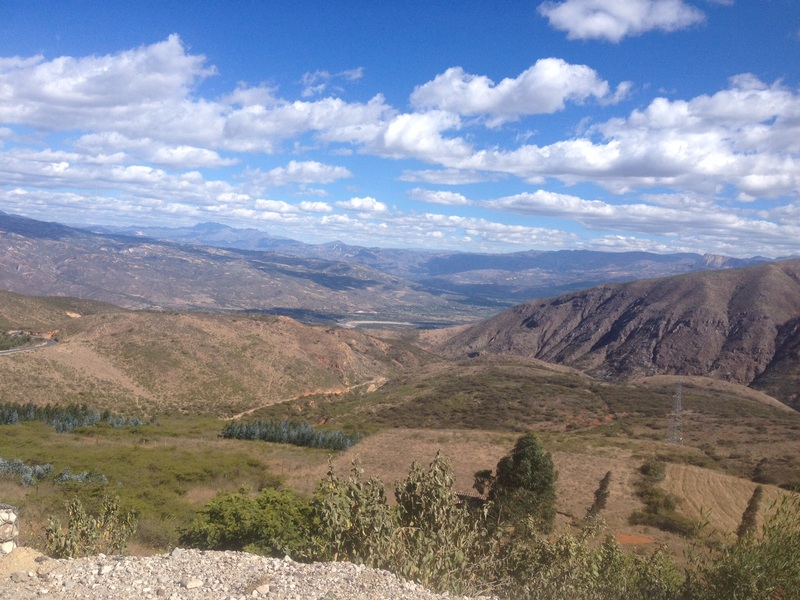 From Pallasaca it was downhill and then flat roads to Chuquicara which was 79 Km’s away. 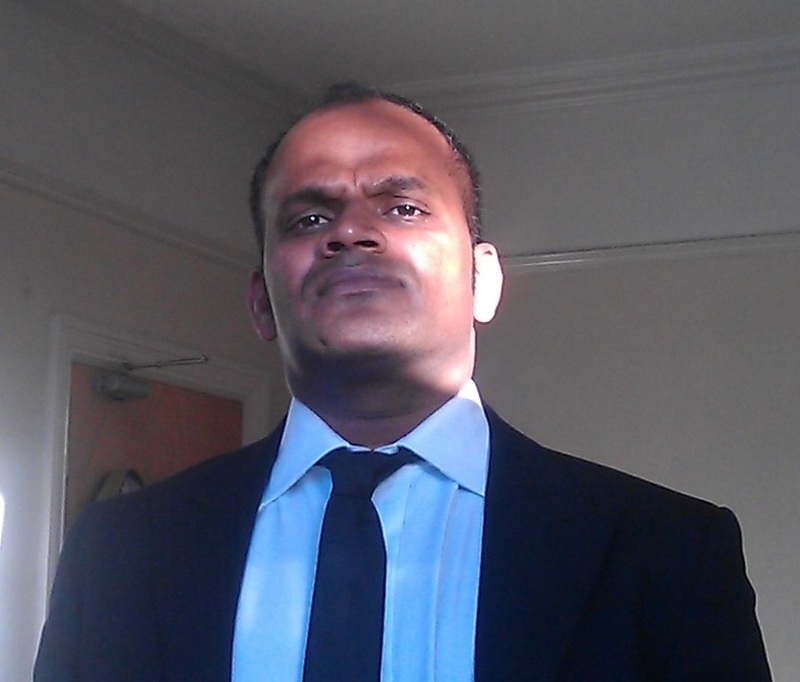 I was hoping for a relatively easy day although the reality had something else in store. About five kilometres of road right after Pallasca had been washed away and the landslides left the road covered in gravel. 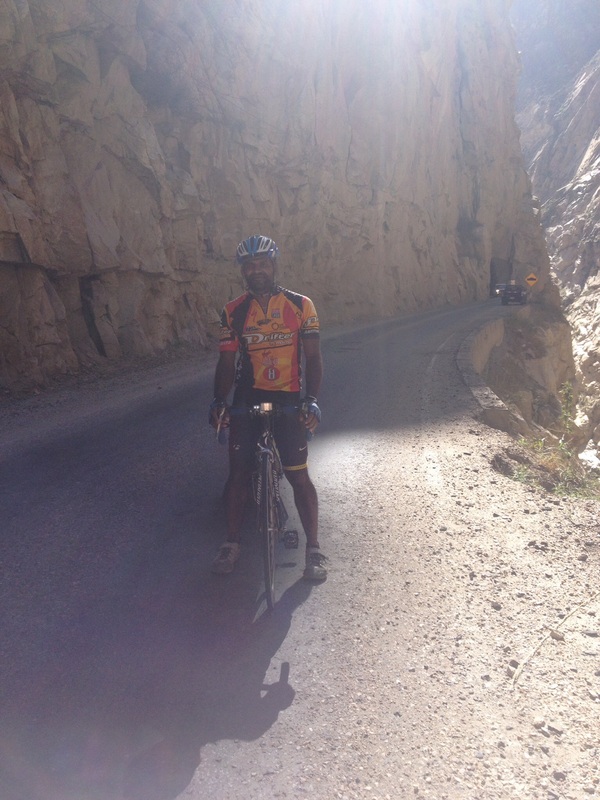 In spite of being downhill, I couldn’t sit on my saddle. It was too bumpy and my bike was slipping and I had to resort to walking. At the end of the downhill was the desert canyon a landscape that I have never seen before. 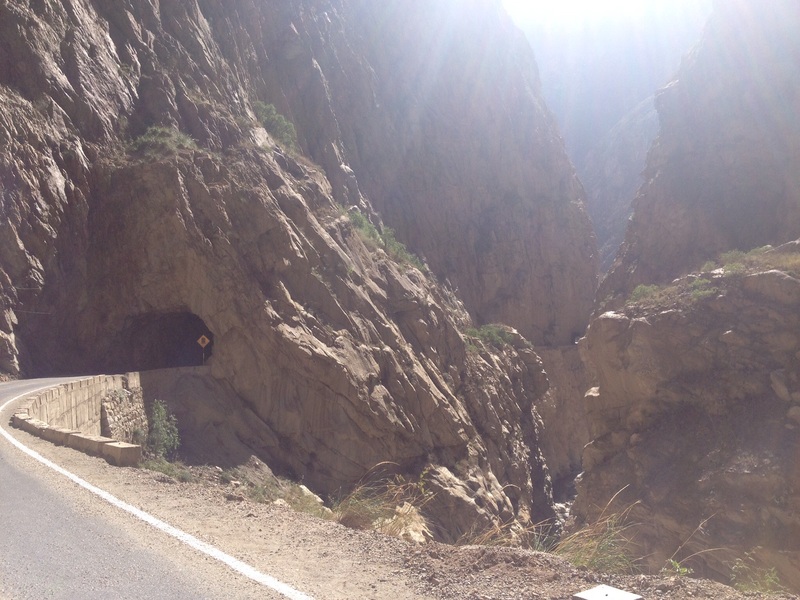 Although the road in this canyon was a gentle descent from 1100 metres to 500 metres altitude over a 50 Km’s distance the headwind slowed me down a bit, nevertheless it was a great experience to cycle through this area. The road was paved and very little traffic once again. During my 6 hour ride I encountered not more than 10 vehicles! On arrival in Chuquicara around 2 pm, I decided to take a bus on the same day instead of spending a night there. This place was hot, dry and very dusty. Once again there was only one bus per day to the next village, Huallanca which left at 11am. It took me about two hours, and with the help of the local police at the check point, to find a vehicle to hitch a ride. 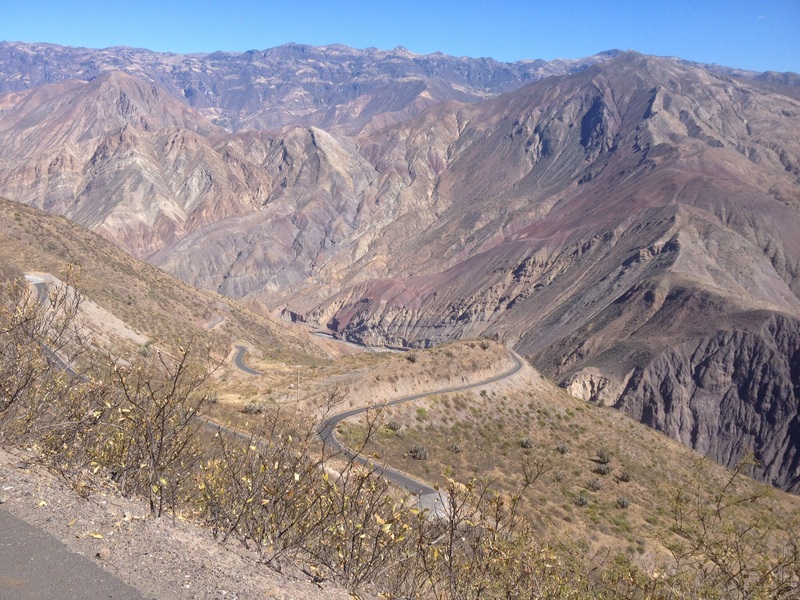 As mentioned by Jason this section from Chuquicara to Huallanca was really bad dirt roads. The ride was bumpy even on a four wheel drive. 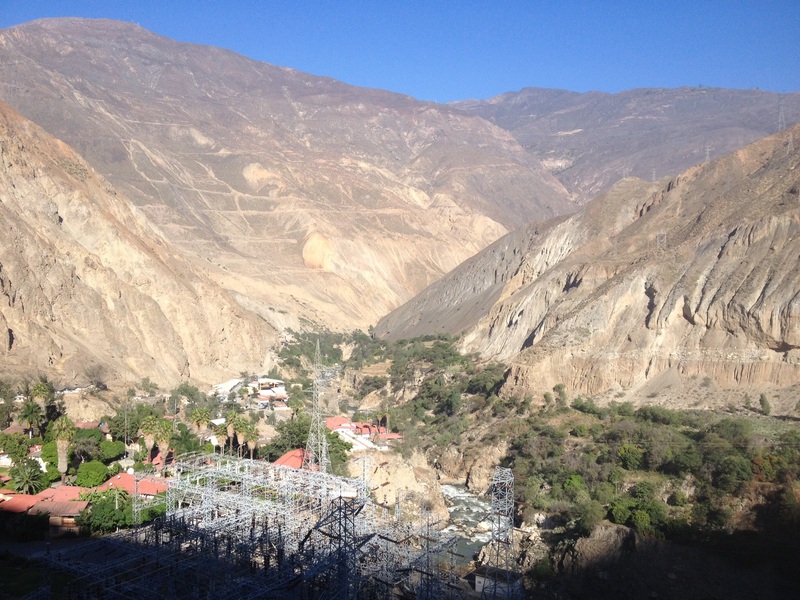 Huallanca was a nice little town surrounded by tall barren mountains and the hydroelectric station here seemed the important economic activity in this village. 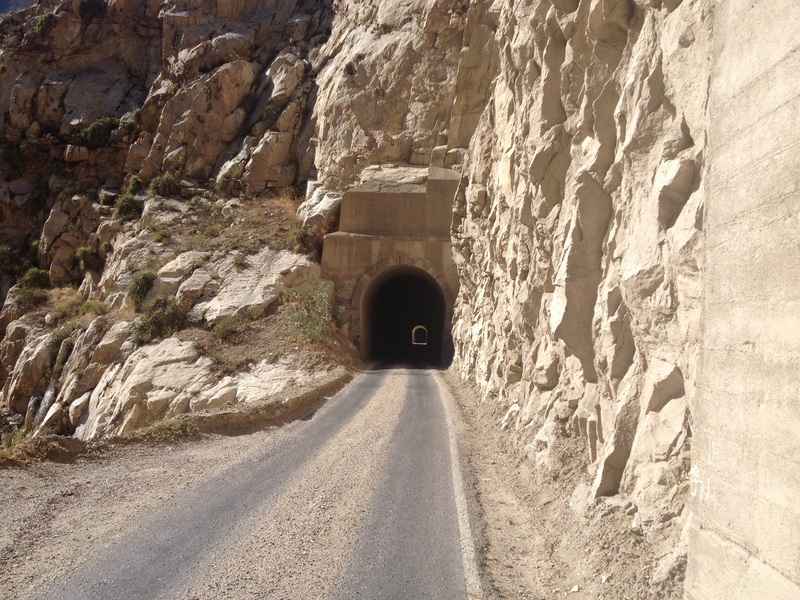 The second important highlight of this section of my route was the Canon del Pato, a series of 35 tunnels over a 10 kilometres distance in the mountains. This landscape will be a perfect setting for some Indiana Jones Arabian adventure movie. 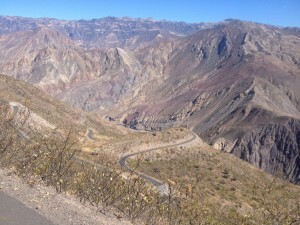 From Huallanca the road was paved again. Although a climb, the ride through the tunnel was an unforgettable experience and highly recommended. However most of the tunnels were shorter except for two long ones around some corners and the lack of illumination heightens the adventure. After the tunnels the single lane road becomes double lane road to Caraz which was 40 Km’s away from Huallanca. 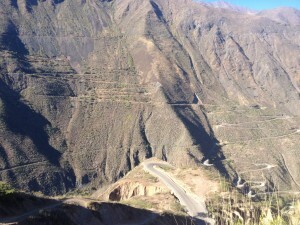 After Caraz and for about 70 Km’s the road goes next to the Cordillera Blanca. The towering snow capped peaks on the side of the road were remarkably different to the canyon landscape I had over the previous two days. At the end of this road was the city Huaraz, very famous destination for mountaineers and this popularity brought some unwelcome traffic indeed. 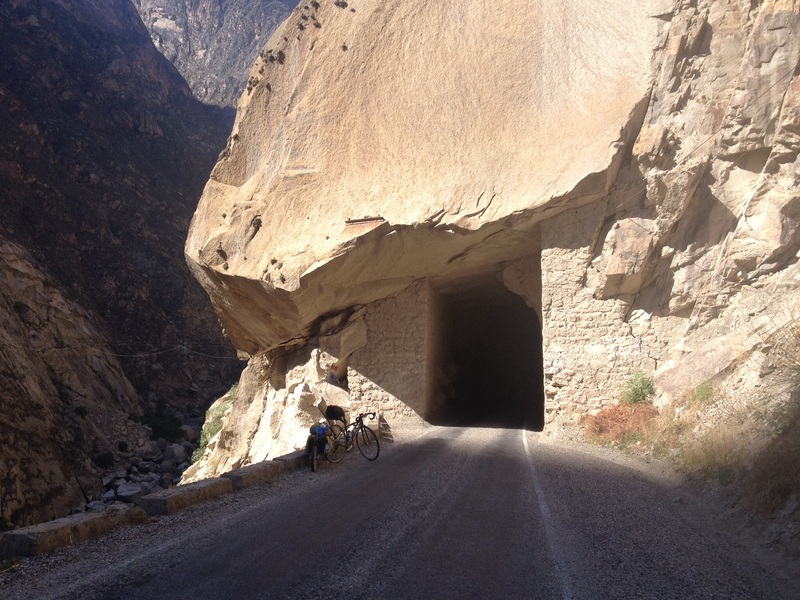 Some of the routes in this section of the ride were key parts of the big objective of this trip. The joy and immense happiness on achieving this was felt several times over the last two weeks especially at Mollepata when I felt one with the One. It is the lessons from these experiences that I believe inspire the pupils when I share with them. 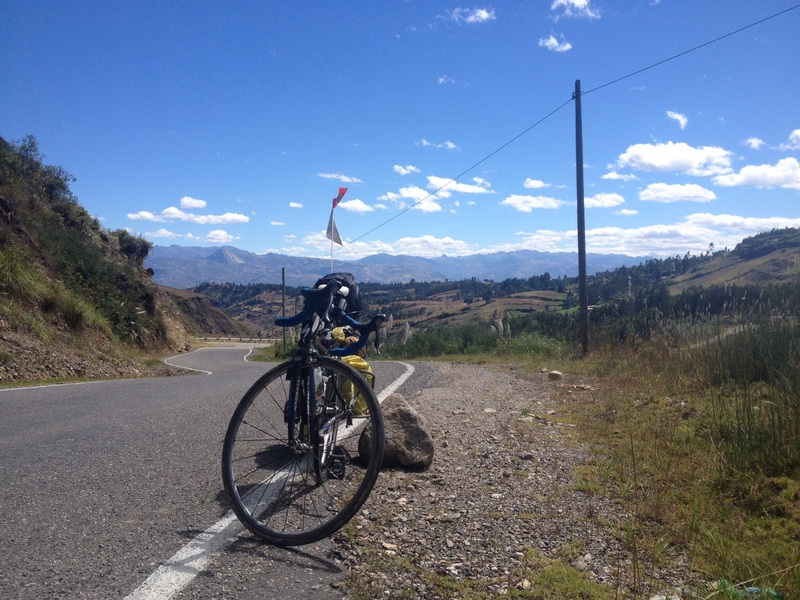 The route (408 Km’s riding): Cajamarca – Agua Calientes (90) – Huamachuco (88) – Mollepata (110 – by a bus) – Pallasca (40) – Chuquicara (79) – Huallanca (67 by a pickup truck) – Caraz (40) – Huaraz (71). 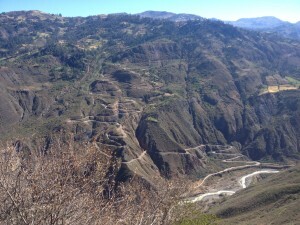 Route notes: Except for the sections where I took the bus (Huamachuco – Mollepata and Chuquicara to Huallance) the rest of the roads were paved. 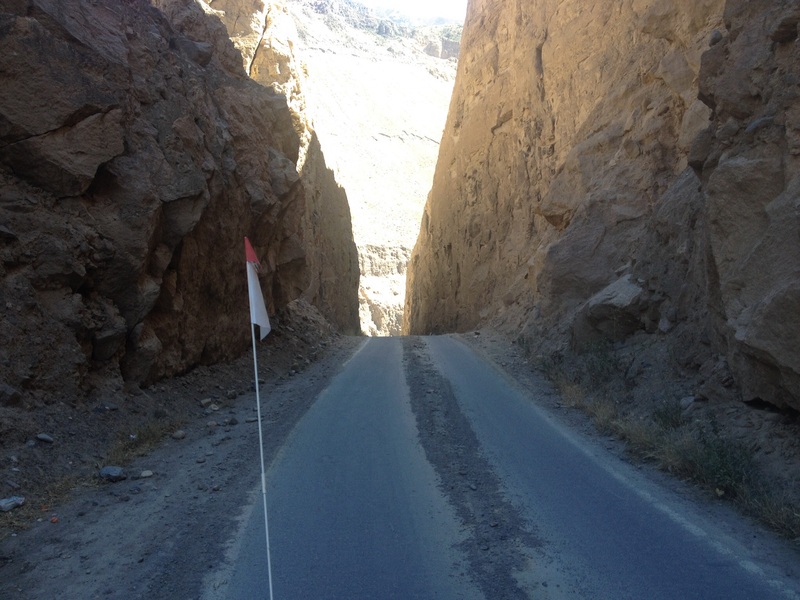 However, there were several sections where the road had been washed out where I could not roll by bike from the saddle but these were relatively short and I walked most of them. The single lane roads were a delight to ride, traffic was almost nil. There were not much shops in between the towns so it is better to stock up in the towns. In Aguas Calientes and Mollepata I camped out. There were hotels (hospedaje) which were just basic at Huallanca and Pallasca. Very interesting.I’m surprised that it s so dry at this part of the year.Not much vegetations too.Keep riding and take care.Bye bye. Hello Line, good to hear from you. 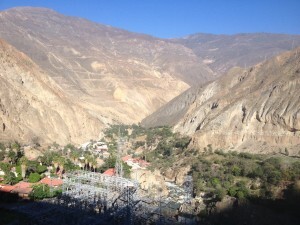 It’s dry season in Peru right now, the valleys are green but the mountains are barren. Incredible scenery, and I bet an unforgettable experience for you! Amazing canyon cycling! Could hear you puffing as well!